Joslyn Castle, located in Omaha, NE, is done in the Scottish Baronial style and was built for a local resident during the mid-1800's. Later, I received E-Mail with a bunch of information. The following is a small part of it. Joslyn Castle was built in 1903 for Sarah & George Joslyn. The Joslyns built their great residence on the site of the Sutphen farm, a property they discovered on a horseback ride and purchased in 1895. John McDonald designed the mansion, built in 1903 at the cost of $250,000. The main house designed in its characteristic Scottish revival style, contained 35 rooms. With the addition of the music room in 1906, the house totaled 19,360 square feet. The grounds included two principal out-buildings, both of which were completed before the Castle: The carriage house (1901) and the greenhouses (1899). The greenhouses were partial destroyed in the Easter tornado of 1913 and were not rebuilt to their full extent. Some of the walls of the original greenhouses were incorporated into a much later (1958) office annex, constructed by Omaha Public Schools. The main structures were built of Vermont silverdale limestone. Main entry is gained through a wrought iron door, weighing over a ton yet balanced in such a way as to require minimum effort to open. 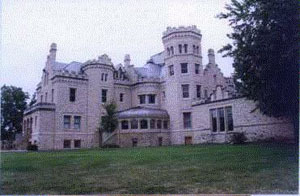 Joslyn Castle has been taken over in recent years by the Joslyn Castle Institute for Sustainable Communities. It was created in 1996 by the University of Nebraska College of Architecture with the cooperation of Nebraska State Building Division. The institute seeks to improve the capacity of communities to address issues of environmental concern in harmony with economic and social development, though its education, research, and outreach programs. Also destroyed in that 1913 tornado was a small lake and bridge, located on the grounds to the west of the Castle; the bridge remains, as well does the outline of the small lake/pond. There are multiple books of the Omaha 1913 tornado still floating around, printed that year, which have extensive photos of the damage. The castle is currently a favourite spot for weddings. Sarah Joslyn also was responsible for the Joslyn Art Museum in Omaha, a pink marble Art Deco edifice, nationally known for it's collections. I would recommend you look at it simply because it is one great building.